A Fashion Smartwatch From A Fashion Brand:LV Unveils The Gadget. In a Smartphone dominated world, invention of Smartwatch was considered as a next big thing which can overtake the reign from ever advancing Smartphones. Unfortunately, even years after first commercial launch of Smartwatches, it couldn’t reach the peak that Smartphones acquired a long before. But, Electronic giants are still working hard to evolve the Smartwatch technology to the level of Smartphones. The well established Fashion Brand “Louis Vuitton” (popularely known as LV) has released a brand new fashion-rich Smartwatch named “Tambour Horizon“(see the pic) running on Google Android Wear OS. By this, LV is marking a strong presence in the advancing Smartwatch Market. 1.2 inch AMOLED touchscren display. 512MB RAM and 4GB of storage. Tambour Horizon is expected to hit the Market with a price range of $2,400-$3,000. 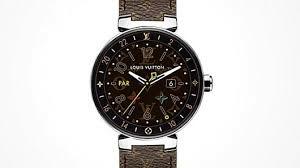 The LV website lists the Swartwatch to be available in different colours. Black, Brown and grey variants are seen listed for both men and women. With Apple followed by Samsung leading the world’s Smartwatch market share, only the time can tell us how well the fashionable LV smartwatch performs in the market. Hi friends, I'm Ijaz. A 3rd year B.Tech ECE Student. My leisure time I spend in search of latest technology. Science is my passion, and never get bored of acquiring knowledge. Also, a die-hard health conscious person. Which Android Phones To Purchase in 2015? What is the GPRS full form? The Gadget Square Copyright © 2019.